Like many a hero before him, Hudson the Railroad Puppy overcame a harrowing ordeal on his journey to a happier life. His origin story begins in September 2012 with tragedy: Someone nailed the paws of 3-week-old Hudson, and those of his two sisters, to a railroad track. 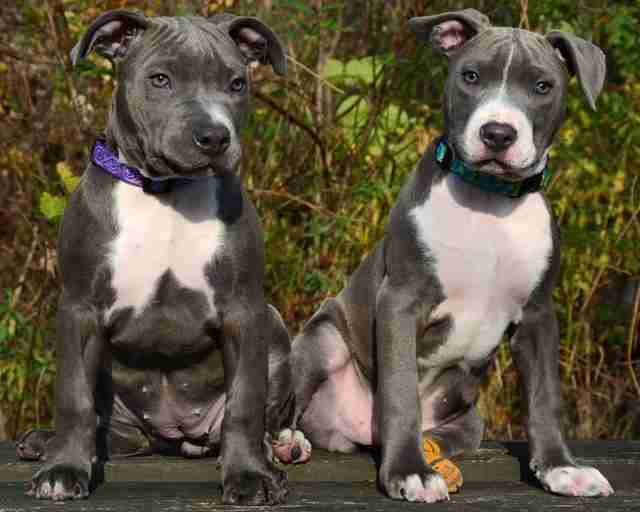 Railroad workers happened upon the cruelly wounded pit bull trio, who were also wracked by malnutrition and dehydration. One of Hudson's sisters, the pup's Facebook page recounts, did not survive. Taken under the nurturing wings of Mohawk Hudson Humane Society, brother and sister began the long process of recuperation. 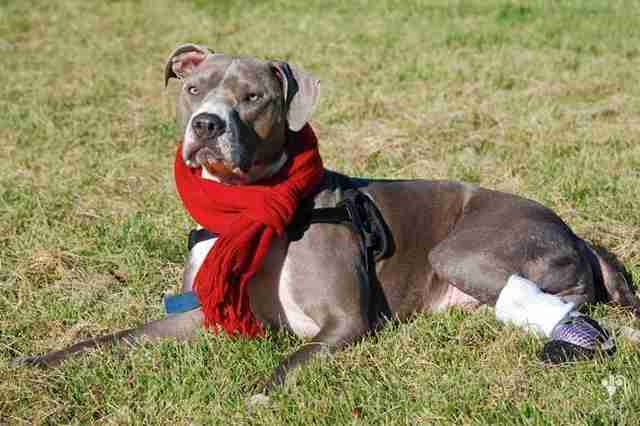 An emergency surgery cost Hudson his paw but saved his life. 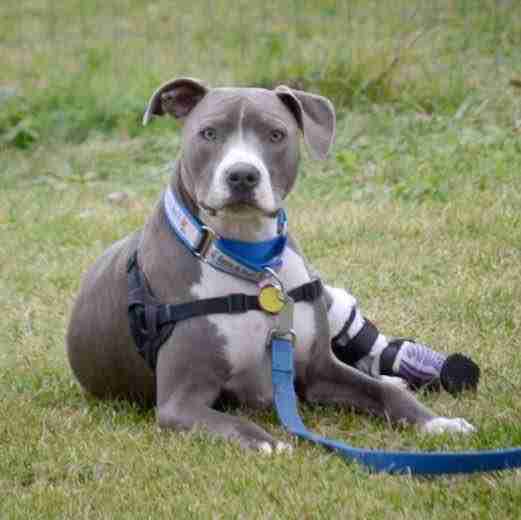 And by October, the dog had received a prosthetic leg, the first of several he would wear as he grew. 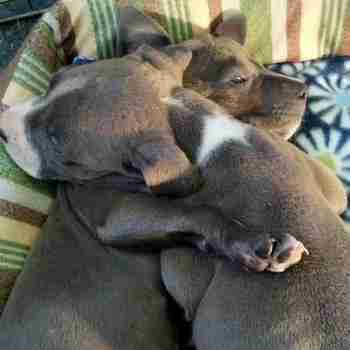 A few months later, both Hudson and his sister Pearl had forever homes. At first, Hudson struggled to get out of bed - but a year later he was jumping on tables. "Not many parents would be happy their dog jumped on the table, but he used his hind legs to get his front paws up on the table and that was a really amazing day," Richard Nash, who adopted Hudson, told Life With Dogs in 2013. "We were crying because we were so happy to see him do that." Hudson, with Nash's help, is now trained as a therapy dog. They visit hospitals and schools, and "Hudson brings smiles to everyone he meets," Nash wrote. The pup is one of 169 gallant dogs nominated for the American Humane Association's "Hero Dog Award," an annual celebration of courageous canines. 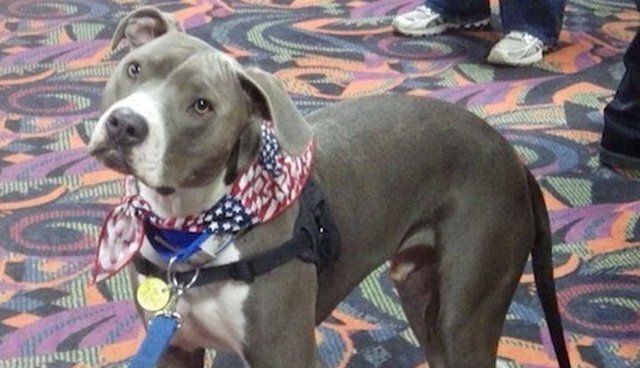 You can vote for your favorite hero, but each pooch is already a winner in our eyes.